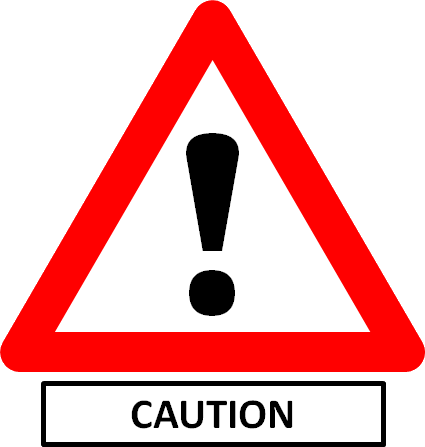 WARNING: pmacademyusa.org / "Project Management Academy USA"
For the past six years I have been following the exploits of Patchree "Patty" Patchrint and Anthony Christopher Jones who claim to run a series of seminars on project management and grant writing. Umm.. and failed restaurants in Los Angeles. I'm not going to repeat all of the information in this post, I advise you to read the whole story. This latest scheme is a quite snazzy-looking website at www.pmacademyusa.org called "Project Management Academy USA". At Project Management Academy USA, our programs are led by practitioners-working professionals who are experts in the process of maximizing results using professional project management practices. Modern industry needs results driven professionals who are focused on a disciplined dedication to effective project management from initiation to closing. We strive to combine real-world scenarios, actual case-studies, with the knowledge provided by PMI and academic foundations to create certified project managers who are prepared for further certification and credential. Our programs are ultra-foundational, meaning they ensure attainment of the universal basics of project management, prepare participants for certification exams, and provide the advantage of our mastery components, which are unique to our programs and are followed by a Masters designation. Funnily enough, the venue seems to be changed at the last minute from the prestigious university it was advertised at to some other location in the rough vicinity. And also, at the last moment the person who was meant to be teaching the course is substituted at the last moment for someone who has to fill in and mysteriously seems to have problems getting paid (if this is you then please add a comment below). If you have doubts about the quality of these causes, I urge you to read the posts and especially the comments that go with them. Those are not my words, but the words of the people unfortunate enough to either pay for a course or who turn up to teach. I blogged about "Project Management International" last year, an outfit running (in my personal opinion) fake or low-quality seminars, at that time using the domain projectmanagementinternational.org. This outfit is run by Anthony Christopher Jones and Patchree "Patty" Patchrint (aka Patty Jones) from California. I've written about this oufit several times in the past five years, but it turns out that Jones and Patchrint have been running similar schemes since 2008. These Jones / Patchrint operations seem to pop up from time to time and then disappear, usually after being exposed for what they are. 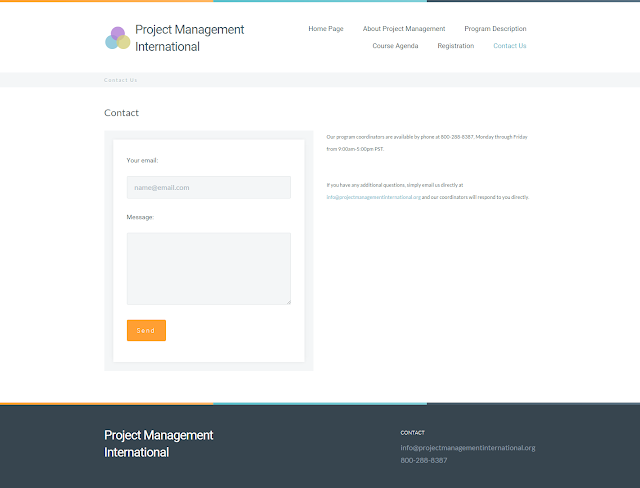 This latest iteration of the fake "Project Management International" organisation uses the domain projmanagementintl.org. It's a flashy-looking site, but really it is just made from a standard template. The "Registration" page lists some prestigious universities as hosting these courses. From what I can tell, the usual thing that happens is that at the last minute the location is changed to a nearby hotel or conference centre, and it seems that no booking are ever made with the university. All feedback on the courses seems to indicate that they are all of very poor quality. There are numerous reports that the people hired to teach these courses are also not paid as promised. The Project Management Fundamentals Course will be offered May 25-27, 2016 at the University of Utah campus in Salt Lake City, Utah. Project management professionals, business and technology professionals, students, and educators are invited to register at the Project Management International website here . The Project Management Fundamentals Course is designed for those seeking professional project management certification. It serves as a thorough introduction to the fundamentals of project management. Those seeking additional credentials such as the PMP®/PgMP®, PMI-SP®, and PMI-RMP® will benefit from this dynamic and interactive work session, while those currently holding credentials will find the certification to be an enhancement as well as the most up to date advanced professional development. Project Management Fundamentals Course provides 24 hours of project management education hours for both PMI's Certified Associate in Project Management (CAPM) ® and Project Management Professional (PMP) certifications. Additionally, the Master Certification provides 24 Professional Development Units (PDUs) for current holders of PMP®/PgMP®, PMI-SP®, and PMI-RMP® credentials. Additionally, the program awards 2.4 Continuing Education Units (CEUs) upon request. Our certificate program teaches technical and business professionals how to master the critical skills of project management techniques as part of their technical career development. The skills developed in the Project Management Fundamentals Course apply to large and small projects, product design and development efforts, construction projects, IT projects, software development, and any project with critical performance, time, and budget targets. Our approach to project management education offers proven, results-focused learning. Courses are developed and facilitated by professional subject experts with extensive industrial experience. Course emphasis is on providing practical skills and tools supported by relevant case examples. · A Project Management International Certificate of Accomplishment is awarded upon completion of the three day program. · Our instructors have extensive industrial experience. They focus on providing you with practical skills and tools using relevant case examples.· Each class is highly focused and promotes maximum interaction.· You can network with other project management professionals from a variety of industries.· Earn Professional Development Units (PDUs) for maintenance of certification under the PMI Continuing Certification Requirements Program.· Applicants for PMI's Certified Associate in Project Management (CAPM)® and Project Management Professional (PMP) certifications will receive 24 project management education hours towards the requirements for eligibility. Participants may reserve a seat online at the Project Management International website , by calling the Program Office toll-free at (888) 201-6372, or by sending their name and contact information via email to the Program Registrar . Upon receiving your registration, a confirmation email is sent to registrants that include session site information, travel information, program description, and details on how to confirm attendance and make payment arrangements. 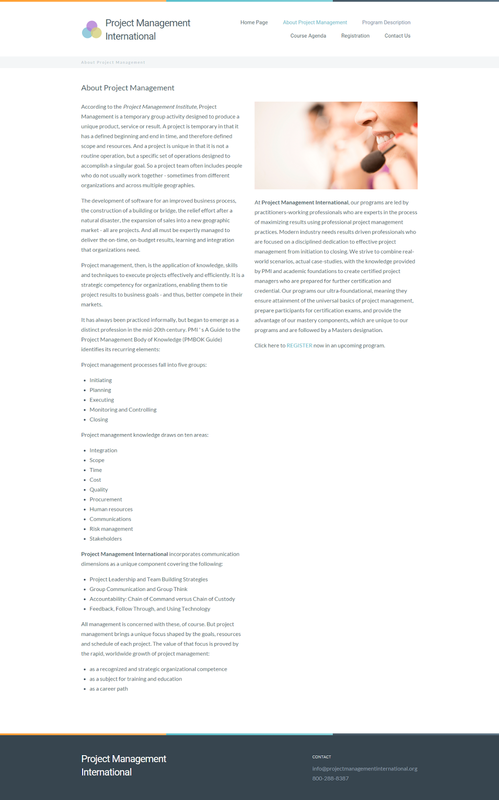 To unsubscribe from this mailing list, simply reply to this message and write EXCLUDE to be removed from future notices. If you see these telephone numbers on other seminar sites, then it will be the same operation. The site quotes a PO box as a contact address but reveals no other information about this so-called corporation. If you feel you have been scammed by this operation then I urge you to report it to the police, FBI, FTC or your local AG's Office. If you would like to share your experiences (positive or negative) then please feel free to use the Comments section below. "Project Management International" (projectmanagementinternational.org) appears to be another website run by Patty Jones (aka Patchree Patchrint) and Anthony Christopher Jones of California. Grant Funding USA advertised a 3-day grant writing workshop for non-profit professionals to be held November 12-14 at the Georgetown Law School campus in Washington DC. The course was described as an overview of the grant writing process and concluding with a certificate in professional grant writing. The cost was $495. My organization paid the fee, I received a confirmation email. I received a credit card authorization letter requesting authorization; we completed and submitted it. I spoke with an individual over the phone confirming my registration. I received a registration packet (about 15 pages) with suggestions for preparation and materials to bring to the course. On the first day, November 12, I arrived at Georgetown Law at 8 AM. The guard was unaware of our course and was working on figuring out where we needed to be (there were 7 other students). After about 45 minutes, we all received an email from the organization Grant Funding USA that said our instructor had fallen ill and they were working on securing a substitute instructor to start the class by the afternoon.At 1pm, we received an email from the same email address saying that they were unable to secure a substitute for Wednesday, but class would begin promptly at 8am on Thursday. I called the number for the organization multiple times and continually got their voicemail. On Thursday, November 13 at 8AM, I arrived at Georgetown again, and found the other students in the lobby upset and confused. The guard was unaware of the course and said he had no information for us. He directed me to the Georgetown Student Life office (who would have been responsible for securing the space). They informed me that Georgetown has never heard of Grant Funding USA nor has a relationship with them. There was no workshop scheduled to be held on their campus. Grant Funding USA has not answered my numerous calls or emails. Other participants fooled by this scam were from Smithsonian Institute and State Gov't of New Jersey. This story seems to be echoed over and over again. A venue is booked at a prestigious location, but changed at the last minute. The person taking the course very often seems to be ill and doesn't turn up. Sometimes an ill-prepared substitute teacher is found, but has difficulty being paid. Calls to the so-called institute are either not answered or met with hostility. Read the comments for more stories such as this. The Project Management Certification Course will be offered July 28 - 31, 2015 at the University of Southern California in Los Angeles, CA . Project management professionals, business and technology professionals, students, and educators are invited to register at the Project Management International website here . 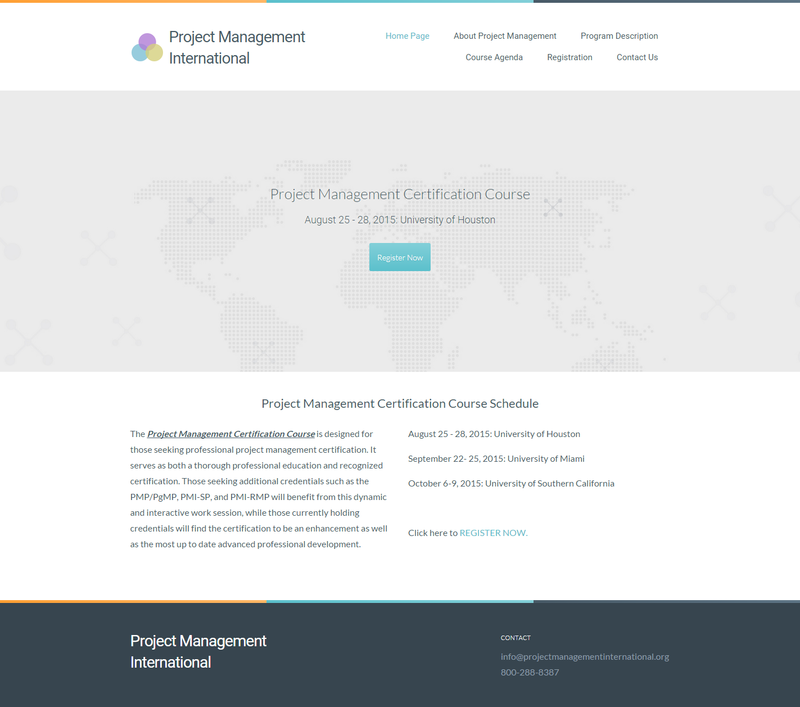 The PMCC is designed for those seeking professional project management certification. It serves as both a thorough professional education and recognized certification. Those seeking additional credentials such as the PMP®/PgMP®, PMI-SP®, and PMI-RMP® will benefit from this dynamic and interactive work session, while those currently holding credentials will find the certification to be an enhancement as well as the most up to date advanced professional development. Project Management Masters Certification program provides 36 hours of project management education, meeting education requirements for both PMI's Certified Associate in Project Management (CAPM) ® and Project Management Professional (PMP) certifications. Additionally, the Master Certification provides 36 Professional Development Units (PDUs) for current holders of PMP®/PgMP®, PMI-SP®, and PMI-RMP® credentials. The program meets the education requirement for all professional designations through the Project Management Institute and other professional agencies. 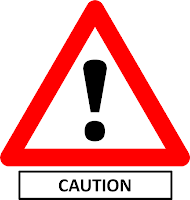 Additionally, the program awards 3.6 Continuing Education Units (CEUs) upon request. The skills developed in the Project Management Masters Certification program apply to large and small projects, product design and development efforts, construction projects, IT projects, software development, and any project with critical performance, time, and budget targets. · A Project Management International Certificate of Accomplishment is awarded upon completion of the four day program of five courses. Completion letters are given for each course. · Our instructors have extensive industrial experience. They focus on providing you with practical skills and tools using relevant case examples. · Each class is highly focused and promotes maximum interaction. 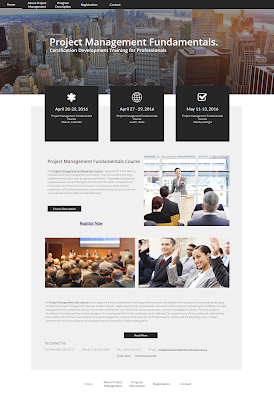 · You can network with other project management professionals from a variety of industries. · Earn Professional Development Units (PDUs) for maintenance of certification under the PMI Continuing Certification Requirements Program. · Applicants for PMI's Certified Associate in Project Management (CAPM)® and Project Management Professional (PMP) certifications will have met all education requirements for eligibility. Participants may reserve a seat online at the Project Management International website, by calling the Program Office toll-free at (800) 288-8387, or by sending their name and contact information via email to the Program Registrar . The underlying code references both info@grantfundingusa.org and grantfundingusa@gmail.com (the organisation mentioned in the BBB report I mentioned earlier) and which is the same site I warned about a year ago. The only other contact details on the site are a telephone number of 800-288-8387. The text is almost identical to the defunct website Institute of Program Management America (IPMA) that I mentioned last year. If you remember, this new website also uses "IPMA" in its underlying URL (ipmam862026.sitebuilder.name.com) which also links the two schemes. A RipOffReport for IPMA also shows the same pattern as before. There is little doubt that this is the same scheme as mentioned in all my previous posts on the activities of Jones and Patchrint. 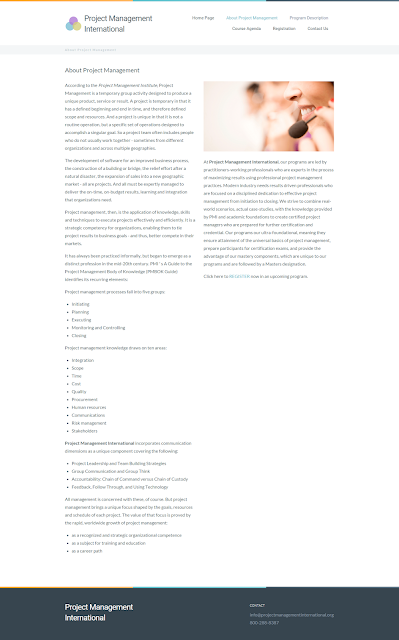 My personal recommendation is that you give this "Project Management International" a very wide berth, and if you feel that you have been defrauded then you would be doing a lot of people a favour if your pursued them aggressively. Also, if you have any positive (or negative) experiences then sharing them in the Comments would be appreciated.